2018 Top Sales & Dealer In The United States for WaterCare®! For the second year in a row All Florida Soft Water has earned the Top Sales award from WaterCare! 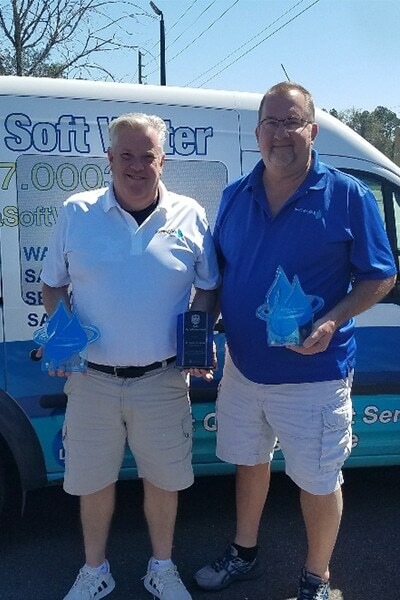 Michael Moon and Dave Copp received Top Sales People in the U.S. and All Florida Soft Water received the award for Top Dealer in the U.S. We’re proud to be able to bring the highest quality water softeners to North Florida, and we are consistently offering unbeatable prices – often times our price is THOUSANDS of dollars less than our competitors! Our high quality water softeners from WaterCare are perfect for the hard water found in Northeast Florida. We couldn’t have done it without our customers, who continue to share the great results our water softeners have brought to their household and businesses with neighbors, coworkers, and friends. All engineering, design, and manufacturing of our industry-leading water treatment equipment is completed in the U.S.A. by WaterCare, based in Appleton, Wisconsin. Thank you to our customers, sales team, and staff for a job well done!